Temporary staffing is a service PERSOL GROUP provides, where our registered temporary staff recruits handle tasks as requested and instructed by the client company they are placed in. As we are able to secure human resources with the required skills swiftly when necessary, we can support your needs in various business scenes. Furthermore, PERSOL GROUP takes care of various tasks such as payments to temporary staff and social insurance procedures, which can alleviate your company's personnel management burdens. We can place the perfect staff to meet your needs through selection of the many registered specialists in various fields from office work to specialized jobs. Access human resources with required skills whenever necessary Whether it is for one day, long-term employment, or short-term or 3 days per week employment during busy periods, we can offer flexible staffing to meet your needs. Reduce costs, tasks and time required for recruitment and employment There is no need for your company to recruit people—we can speedily secure the human resources immediately ready to work for you. Reduce personnel management costs, such as salary payments and social insurance procedures. No more worries about salary calculation or social insurance procedures. Our service will help you by reducing personnel management burdens and costs. Replacement staff, such as during regular employees' childcare leave. Increasing staff temporarily during busy period. Handling of large amount of tasks. Increasing staff for positions that require specialized skills. We can place staff to handle specialized jobs—from office work or business management to IT-related technical positions—and in various kinds of employment status—such as part-time and nightshift. We dispatch human resources that meet your needs by selecting them from the many people registered with us. We take time to conduct our own skill check, interview, and aptitude test to secure staff from various aspects. Through centralized administration of registered staff information using our own system, we are able to quickly select the right people for you. By regularly visiting the work place, offering job counseling, establishing staff consultation desk, and other services, we provide post-placement support to ensure the temporary staff we dispatched demonstrates their full abilities and to ensure they can work in a stable condition. We provide pre-employment etiquette guidance, as well as security training with compliance in mind. Furthermore, we also offer home e-learning and various courses on subjects like computer, English, and business skills to help our temporary staff improve their skills. PERSOL GROUP provides services based on compliance. In addition, we are also making efforts to provide information on related laws and regulations, so that you can rest assured with our services. For reinforcing business during the short period prior and after release of new products. For processing accounting documents at the end and begging of each month. For translations of reports required to be submitted to overseas head office. Computer operation/Personnel, general affairs, business management/Finances & Accounting/English-related clerical job/Secretarial tasks/Trading/Interpreting & translation/Reception/Telemarketing/Sales/IT/R&D/Nursery teacher/etc. PERSOL GROUP will discuss with you in detail why you are requesting for temporary staff, the type of work involved, and employment conditions, and propose the best way to use our staffing services. 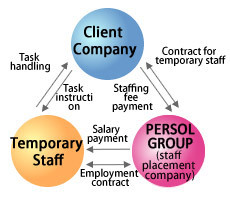 PERSOL GROUP will select the right temporary staff that suits your request. The time required for the selection will vary depending on the job content and required skills. After signing of contract for the placement of the temporary staff, the staff will handle the requested tasks by following your instructions. All placement fees according to the actual hours of work done during the placement period will be borne by you. A representative of PERSOL GROUP will regularly visit the work place and check the working conditions of the temporary staff to discover and solve any work-related issues at an early stage and support stable employment.